The D.Ed First Public Examinations Hall Tickets will be uploaded on Andhra Pradesh Board of Secondary Education(BSEAP) Official Website by the Education Department Officials.D.Ed first Year Candidates Can download their Hall Tickets in the given following link. After Select Your District Name, School Name and Select Your Name then Click on Submit Button and Download Your Hall Ticket. This Hall Ticket is entry pass of the examination hall. So, candidates must keep their hall ticket while you are going to the examination. The first year of the 2016-18 batch of DED exams will be conducted for the first year students from May 17. The Officials said in a statement that students who have to attend the exams can get hall tickets from the respective colleges. He said the hall tickets have been sent to all colleges principals. 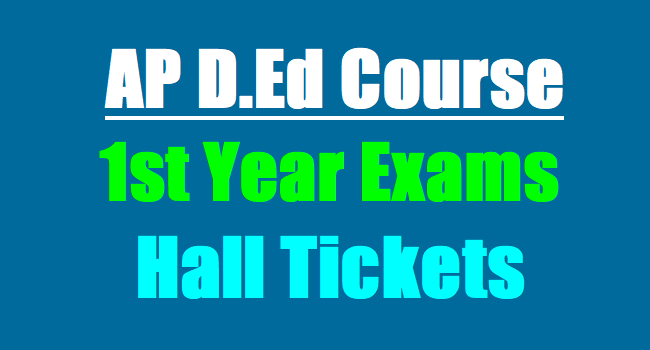 AP D.Ed 1st year Hall tickets are available on BSE AP Web portal. Candidates may download your hall tickets from the given below link. The test will be conducted from 9 am to 12 pm on all these dates. BSE AP Web Portal: http://bse.ap.gov.in/ . Sir exams postpone ayyayanta nijamena sir andarilaga paper choosi cheppadam kakunda teliste cheppandi sir. Sir exams postpone ayyayanta nijamena sir meeru kooda andari laga news paper choosi cheppakamdi sir konchem munde information ivvandi sir please. So, wait and see about 1st year exams schedule..